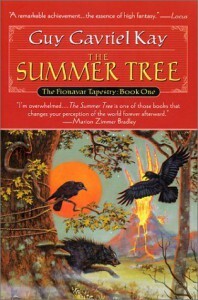 The Summer Tree, book one in The Fionavar Tapestry by Guy Gavriel Kay is an epic fantasy tale that I absolutely enjoyed reading. The book is not perfect, especially at the beginning. But as the story moves forward the wrinkles are ironed out and you are left with a complex adventure that must be followed through to the end, whatever that may be. The novel begins as many fantasy tales do. There is a magical land, a looming evil, and ordinary characters thrust into situations that force them to discover extraordinary abilities. In The Summer Tree, five university students are pulled from their world by mage Loren Silvercloak to Fionavar, a magical land and First of all Worlds. Kim, Paul, Kevin, Jennifer and Dave soon find out that they will not be returning home any time soon and that they all have a role to play in the coming war against evil. Fionavar itself is also not unique and neither are the people who inhabit it. This does not hurt the story though as because the land and its people is familiar to readers, Kay is able to build a far richer world. My biggest complaint was how the story is first set up. Why these five people decide to go with Loren is never really explained. All the mage has to do is show the group a mirage of the castle they are to be taken to and off they go. On top of that, they are brought to this other world, losing one of their party in the process and none seem to be shocked by any of it. They even allow themselves to quickly become separated. But it is a good thing they do! Because as the five branch out, the characters develop into something more and you begin to fall in love with the novel. The basic fantasy plot drops away as the characters individual stories develop and Fionavar’s tragic history unfolds in the form of legends told by its people. In The Summer Tree there is no guarantee that good will succeed or that the five students will even survive. Early on they begin to suffer horribly. They sacrifice themselves for a world that is not theirs and for people who they barely know because they are given no other choice. Kay writes beautifully. He doesn’t waste time with flowery descriptions and instead sets the mood using carefully thought out prose. He takes a well-used formula and transforms it into something special. Before I had even finished the first book, I made sure to go out and purchase the other two so that I could continue the story without any delays. So, if you’re looking for an epic read, pick up The Summer Tree.